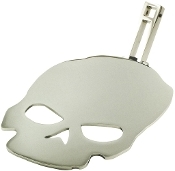 Skull Luggage Rack for Corbin brand back rests or any other brand that uses the 5/8" square post or 1 1/4" or 1 1/2" wide flat post. Shield Luggage Rack for Corbin brand back rests or any other brand that uses the 5/8" square post or 1 1/4" or 1 1/2" wide flat post. Luggage Rack for Corbin brand back rests or any other brand that uses the 5/8" square post or 1 1/4" or 1 1/2" wide flat post.